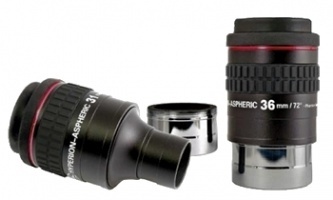 Modular dual 31.7mm/50.8mm widefield eyepieces that performs as well as eyepieces three times its price. Will work in conjunction with a Baader adaptor ring to mount a camera directly onto the eyepiece. Baader's new Super-wide 72 degrees 2" eyepieces feature Phantom-group multi-coating, internal baffling and aspheric elements for a remarkably high level of optical correction. Even Bestsellers can be improved: This most highly rated Hyperion zoom-eyepiece is available now in its fourth generation and has become a lot more versatile. The 290 gram housing is lighter by 80 grams and now features a slim 55 mm diameter, both features that make it even more desirable for use with binoviewers. Morpheus is the God of Dreams – and after more than four years of development Baader present the eyepiece of our dreams: The MORPHEUS® 76° WIDE-FIELD OKULARS. 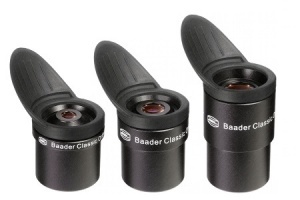 Baader Q-Turret & Classic eyepiece set – offers maximum ease of use and a full spectrum of magnifications in one set. A fantastic combo deal including the massively popular and high quality Baader Hyperion Mark IV Zoom with the Hyperion 2.25 barlow lens. 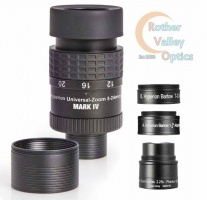 This combo gives you a wide range of magnification for various applications. The Hyperion design has has both a 31.7mm (1 1/4") and 50.8mm (2") barrel for fitting into either size focuser or diagonal. Both barrel sizes have a safety groove for safe use in your telescope. Complete with 4 Hyperions plus the hard case to eventually house them all. The Hyperion design has has both a 31.7mm (1 1/4") and 50.8mm (2") barrel for fitting into either size focuser or diagonal. Both barrel sizes have a safety groove for safe use in your telescope. 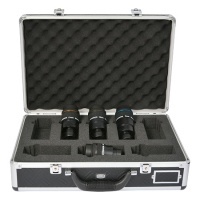 Complete with hard case to house all 7 hyperion eyepieces.